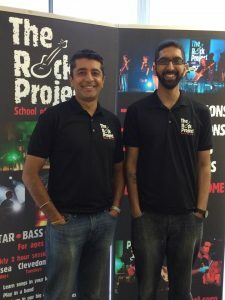 The Rock Project is the UK’s premier school of rock and pop and was founded in Denbigh, North Wales in October 2005. Since then, The Rock Project now boasts numerous schools around the UK and has taught thousands of young people. The Rock Project Berkshire opened in September 2015. Harmeet Nandra, who after working in the city as a development director, decided to change his career and follow his passion for music and working with children, runs it. Along side Harmeet is his brother-in-law, Raj Puni, who has been playing the drums for 12+ years.